RUSH: To Fresno, California, next on the EIB Network. Rush Limbaugh here with Christina. Great to have you. How are you doing? CALLER: I’m doing great. I’m a conservative in California, and I watch the PGA and baseball. You’re talking to a real live unicorn. RUSH: Well, I am happy to have you in this audience. That is just delightful. I’m glad you got through today too. What’s happening? What’s up? CALLER: Well, Devin Nunes is my congressman, and he’s doing a great job. I feel like if the president, if he’s not gonna read the memo at tonight’s speech then he needs to at least end it by saying the State of the Union is corrupt. RUSH: Well, I don’t think he’s going to read it at the State of the Union. I know that there’s a sentiment, a lot of people hold it, that it’d be great if he would do it and expose it that way. But from everything I understand, Christina — and, remember, this could all be smoke and mirrors. Trump is gonna talk cooperation tonight. He’s gonna talk unity. He’s gonna talk Republicans and Democrats working together for America on specifically his infrastructure package. Well, instead of me opining on that, what’s your reaction, if that is what happens, what will your reaction be to it? CALLER: Honestly, it doesn’t matter what the president says because the left, the Democrats in the audience are going to be sitting on their hands. I mean, I don’t care if he comes up with a cure for cancer, they’ll find something to criticize him about. They’re not gonna give him anything. And so I think, you know, we have a unique president, probably the best in our modern time. He treated the election like a job interview and now he is trying to execute and he’s come across a big political wall, and that’s even from, you know, the Republicans. So he’s doing the best he can in the swamp, and my husband got one of those thousand-dollar bonuses. Actually it was $914 ’cause the government already got their cut. And according to Pelosi, I was supposed to put that through the shredder because it didn’t mean anything, it was crumbs. RUSH: Yeah, it was just crumbs, exactly right. So your husband already got his bonus. CALLER: Oh, already, about a week after the company made the announcement, it hit our checking account. RUSH: Hot damn. How’d that make you feel? CALLER: That made me feel wonderful. First we tithed to our local church 10%, and then you know what? We’re holding onto it because we may need to bail out a local restaurant server if the straw police come for them. RUSH: Local restaurant server if they come — what do you mean? CALLER: — straws in the restaurant. RUSH: Oh, folks, if you haven’t heard this — thank you, Christina, for the call. There is this madcap congressman, a California assembly man — is actually trying to ban plastic straws in California for, you know, the usual climate change pollution, recyclable reasons and all that, and who knows what other reasons. And these servers, waiters, can be fined up to a thousand dollars if they serve straws, if they bring straws. That’s why she was saying they’re gonna hold on to their nearly one thousand-dollar bonus after tithing 10% to the church, to be able to help a server who might accidentally get charged a grand for giving some customers a straw. Or six months in jail. It’s either six months in jail or a thousand-dollar fine for serving plastic straws. I did used to live there, Sacramento, California, is my adopted hometown. That will never change. But it wasn’t this wacky. When I was there, they were electing Republican governors. When I was there, they were just coming off Pete Wilson. Pete Wilson was governor, then George Deukmejian before that. Reagan was president when I was in Sacramento. California had not become what it is now. It was trending that way, but it hadn’t gotten close. Willie Brown was the speaker of the assembly. 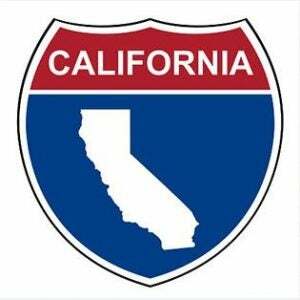 Is there any chance that California will ever come back? I don’t know. Has Cuba ever come back from — I don’t know. Is there a Republican Party that means anything there? RUSH: This Brianna Keilar. She’s an infobabe at CNN and this was this morning on one of their shows. She’s asking the former Ted Cruz communications director Alice Stewart about Trump’s first State of the Union Address and here’s the question and the answer. KEILLOR: Is it even possible, Alice, for him to really make a difference in a State of the Union Address when he has evoked such emotion with his off-the-cuff, seemingly from the heart comments over the last year? STEWART: It is possible and just like baseball you’re only as good as your last game. And I think this — tonight he will be on his game, he will be on his prompter, he will be on message because he has been working on this for quite some time. RUSH: Can he make a difference? Can Trump really make a difference, Alice? Is it possible, he shoots from the hip and we hate him so much. Can he really make a difference? Because I guarantee you in her mind whatever Trump does, it isn’t gonna change anything. There’s no way the Drive-Bys’ impression of Trump is gonna change unless he abandons everything he stands for. And even then they would still hate him personally. They would claim they had defeated him, and they still wouldn’t love him. Now, one of the traditions that survives the Trump presidency is that on the day of the State of the Union the president invites members of the opposition to come up to the White House and have lunch, the media. And Wolf Blitzer was one of the accredited journalists invited to have lunch with Trump today. So Wolf went, and after lunch he raced back to CNN to report what had happened. 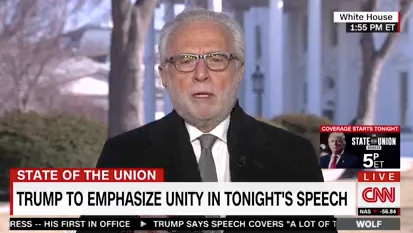 BLITZER: This is something that traditionally happens every State of the Union. It’s always off the record, although at one point he did want to go on the on the record and he did make an on the record statement. He said his goal is looking ahead not only this year, but in the years to come, this is the president, saying I want to see our country unified. He said he wants to see our country brought back from all the divisiveness that’s going on right now, the bitter infighting between the Democrats and the Republicans. And he said he’s not only talking about the Obama years, but he says he wants to go back to the Bush years. He would see it as a great achievement if he could make our country more unified, try to bring the country together. RUSH: What did I just say to a caller who was hoping Trump would read the memo tonight. I said everything I’m hearing is that he’s going to make a pitch for unity, working together, crossing the aisle. Now, she didn’t ask me what I thought that meant. I asked her what she thought it meant. And I think Trump is continuing — this is not to say this is a result of the Wolff book, but just like that 55-minute meeting on immigration with the Democrat and Republican congressional leaders, I think Trump is attempting to show as often as he can in mass audience events that he is not what he is described as being, that he is actually seeking unity. And I think he’s attempting to illustrate that the obstacles to this are not him, but rather the Democrats. I think that’s what he did when he offered to amnetize 1.8 million DACA DREAMer kids knowing full well that the Democrats would reject it. He wanted to be seen as the facilitator, the compromiser or what have you. And the Democrats fell right in line. They had a cacophonous, knee-jerk reaction. “No way. No way. Not enough.” Whatever they did, they portrayed themselves as not even interested in compromising with Trump on anything, which they really can’t afford to do, given the way they campaigned against him and the way they’ve portrayed him the last year. For them to all of a sudden switch gears and compromise on his initiative? Man, would there be hell to pay in the Democrat base. The Democrat base would view that as the biggest cave in their memory if the Democrats start cooperating with Trump. Now, if it was the Democrats acting cooperative and proposing cooperation and proposing issues where the compromise was possible and Trump was acceding to it, then they might not have a problem. But if it’s Trump proposing it, if it’s Trump’s initiative and the Democrats all of a sudden decided to meet him halfway, there would be hell to pay. So don’t worry about this happening, ’cause it’s not gonna happen. The Democrats are not going to forget, give up, be talked out of this objective of impeaching Trump and throwing him out of office next year. It’s predicated on them winning the House and if they can, the Senate, presenting the articles of impeachment that will already be written. They are writing them now. Just like Obamacare was sitting in a drawer for six years waiting for the right moment to introduce it. They probably have been written and they’re just being added to with each supposed Trump outrage. So I think if the Democrats win the House — and I don’t think they’re going to, by the way. I’ll go out on a limb and say this. But if they do, the first thing that’s gonna happen after the new Congress is sworn in, articles of impeachment will be presented. That will be the first thing they do. As such, the Mueller investigation cannot end. As such, the FBI-DOJ investigation and the dossier cannot be put to bed. That’s why the release of the Devin Nunes memo is so important.